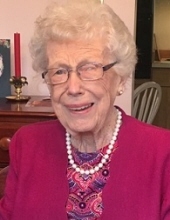 Margaret M. McCormack "Peg" of Cherry Hill, NJ, died March 15, 2019. She was 95. Beloved wife of the late John G. McCormack. Loving mother of Kathy Yash (Chuck) of Rancho Santa Fe, CA and Kevin McCormack (Lori) of Sicklerville, NJ. Devoted grandmother of Meagan and K.C. Yash and Fallon and Kelsey McCormack. Loving aunt to 7 nieces and 14 nephews. She was predeceased by her sister Elizabeth M. Luce and brothers Joseph A. “Bud” O’Hara and Peter J. O’Hara Jr. Dear sister-in-law of Ruth O'Hara and Marge McCormack. Peg was born December 4, 1923 in Philadelphia, PA to the late Peter J. and Mary A. "Lynch" O'Hara. She was a proud graduate of St. Mary's Academy. A 60 year resident of Cherry Hill; Peg retired from the Cherry Hill Tax Office. The family wishes to thank all the nurses and staff of Lighthouse Hospice for their excellent care. Relatives and friends are invited to attend the viewing Saturday morning 10 to 10:45 AM at Christ The King RC Church 200 Windsor Avenue, Haddonfield, NJ 08033. Mass of Christian Burial Saturday 11 AM. Interment private. In lieu of flowers contributions in her memory may be made to Christ The King Church at the above address. Please visit schetterfh.com to share your condolences with the family. To send flowers or a remembrance gift to the family of Margaret M. McCormack, please visit our Tribute Store. "Email Address" would like to share the life celebration of Margaret M. McCormack. Click on the "link" to go to share a favorite memory or leave a condolence message for the family.